Hyderabad: They may not have access to the best facilities, nor wear famous fashion brands or go to fancy colleges, but in terms of ideas the rural youth are on par with the best budding young minds anywhere. One of the biggest ever National Rural Technical Festivals –Antahpragna 2018 reaffirms youth in rural areas has talent. The spectacular rural tech fest concluded in the wee hours of Friday. Prof. V. Chandra Shekhar, Centre Director for Tata Institute of Fundamental Research said that cricket until recently was confined to few urban elites, but once it went rural, they took the sport by storm. The real talent is in rural India and it is unexplored. Future Noble laureates and Narayan Murthy’s will come from institutions like RGUKT Basar which nurture rural talent, he said. We all remember, innovator Chintakindi Mallesham “Padma Shri” awardee unable to bear the plight of his mother invented a weaving machine. Similarly, a young boy from Zilla Praja Parishad Secondary School, Chilpur in Warangal District came up with a Digital Seed Dryer seeing problems faced by his family in the village when drying seeds. His Project ‘Digital Seed Dryer Model’ sensing rain automatically covers the area where the seeds are left to dry and even switches on fans to dry the seeds. His model won an award at the technical festival. Two projects which were showcased in earlier events viz. Campus FM Radio Station and Biometric Attendance System (that automatically sends SMS to the parents when their kid arrives at the institution and when they leave the institution daily) are soon going to be reality. RGUKT Basar is going to implement these soon. District Collector of Nirmal Smt. M. Prashanthi and Adilabad District Collector Ms. D. Divya said that they are ready to field test the models / projects of students in their districts if they come with problem solving ideas. ‘AgriGuide’, an agricultural education and training app is the need of the hour to empower farmers. Towards this end RGUKT Basar’s students, B. Venkatesh and E. Rajender, 4th Year CSE students developed a farmer friendly app. It has features such as Crop Information, Market Price, Subsidy Info, Zero Budget Farming, and Horticulture Contact. The App can provide information about 63 crops like which crop is right for which soil, what diseases occur in what crop, what pesticides to use, Market price on particular day in particular area, etc. The App Zero budget farming provides information for organic forming, how fertilizers that be made with ingredients that are easily available like neem leaves, cow dung, etc. We have government employees. 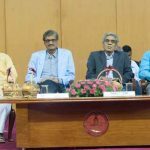 How about “Government Farmers?” asked students at the Antahpragnya 2018 Technical Fest. A brilliant idea given their age. Why don’t we bring farmers under government fold? We have more than 33 lakh acres of government land across the country. More than half of that is barren and is not useful to anyone. This can be made use by using technology and many engineers. This can effectively use Government land and can generate more employment explained the young students. Kaleshwaram Lift Irrigation Project which is in the news was the mammoth model developed painstakingly. Given the importance of the project as it claimed to be the costliest irrigation project to be taken up by any state till date, our interest arose. Our working model of Kaleshwaram Project took one and half month time and Rs 30,000 claimed 3rd year Civil Engineering students of RGUKT. The real project cost is estimated to be Rs 80,500 crore. So should be our model. It is a mammoth exhibit spread over 100×60 feet created with sand, cement bricks, red bricks, mud, grass and paint. The working model used gates made from iron sheets with DC motors for lifting them and pumps for pumping water. Have you ever got stuck in a place where you do not have power to charge your mobile, urgently you need power. Don’t worry you can use any vegetables or fruits to power your phone. Charge your mobile using vegetables and fruits. It’s amazing isn’t it? The Chemistry Department students of RGUKT students came up with a brilliant solution. A Smart Ambulance project showcased promised to decrease the time taken to take the patient to the hospitals using IoT devices to make traffic signals give priority to the Ambulance at Signals on cross roads. A model of Smart Plough that can automatically plough the fields and sow seeds was also displayed. Developed by 3rd Year B.Tech students, the smart plough consumes low power and can even be made to run on solar power, say the beaming students. Helmets are bulky and are difficulty to be carried. Kids came up with foldable helmets, the essential road safety product, which is convenient to carry around. Moved by an accident involving a school bus crossing a railway gate, a student developed Automatic Railway Gate Control System to reduce the accidents at the railway gates. 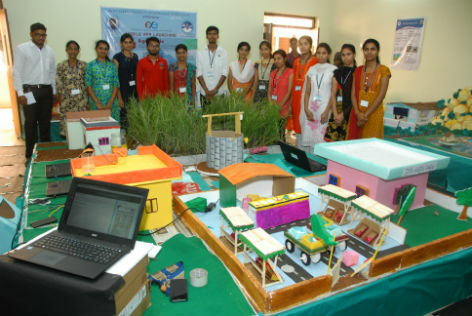 ‘Smart Village’ project made by a group of students showcased a village with rural development based real time working models. It showcased Self-driving Plough, Smart Dustbins, Automatic Water Level Sensing, Automatic Street Lights, and Weather Forecasting among other things. ‘Solar Tracking System’ model which tracks solar panels towards the sun for maximum utilization was adjudged the winner of Best Working Model in EEE Dept. 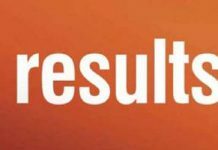 ‘Energy Repercussion Impact system’ model bagged the First Prize in Civil Dept. for Best Working Model. The model proposed a stepped Spillway instead of the current used curved spillway to reduce the force of impact of the water and soil erosion. ‘Micro Hydro Power plant’ model was another innovative model which can be an economical model instead of dams which forces large resettlement of people and environment issues. The Micro Hydro Power plants can be an alternative for people with minimal environmental impact. Ideas, Models and Prototypes such as Amphibious Cycle; Sustainable agriculture; Solar based Irrigation system; Piezo Electric Roads; Cotton picking Drone; etc. were testimony to the talent of the rural students. Over the three days Antahpragnya Technical Festival saw over 100+ Technical events, 100+ cultural and Fun N’ Learn events, display of over 250+ Posters, all together over 300+ models / prototypes were exhibited. The cumulative participation of the students reached over a lakh of people, making it probably India’s biggest rural technical festival, said Dr. A. Ashok Kumar, VC, RGUKT, Basar. Nearly 25000 people from nearby places and other schools and colleges witnessed the Biggest Rural Technical Festival. The technical festival nurtured science and encouraged scientific and technological talent in students.